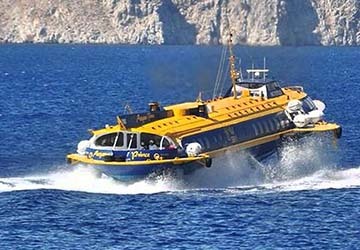 Dodecanese Flying Dolphins - View timetables, Compare and book ferry tickets at directferries.ie. 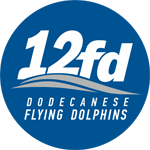 Dodecanese Flying Dolphins, formerly known as Phoenix Marine, links the Turkish cities of Fethiye and Datca with the Greek islands of Rhodes and Symi in the Dodecanese archipelago. 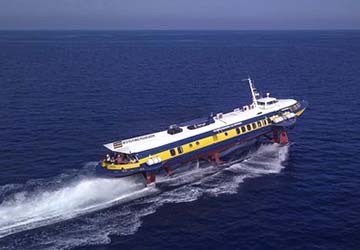 Dodecanese Flying Dolphins uses a high-speed hydrofoil called Aegean Prince, boasting a top speed of thirty two knots. It can carry over a hundred and thirty passengers and was designed with a comprehensive range of safety and telecommunication equipment, ensuring each sailing is quick, comfortable and completely stress-free. When travelling with Dodecanese Flying Dolphins, the island of Rhodes, sitting just over seventeen kilometres from the Turkish coast, is just an hour and a half’s crossing from Fethiye, and an hour from Datca. Symi, a Greek island famed for its vibrant festivals, is under half an hour away, too. The company offers some of the fastest ferry crossings in Greece, so it couldn’t be easier to hop between the beautiful Dodecanese Islands and some of most picturesque port cities on the Turquoise Coast in southwest Turkey. Directferries.ie allows you to compare Dodecanese Flying Dolphins timetables and fares with all alternative ferry operators before deciding on the best option for your trip.